You can drive over this. A very minor public road connects Kilfarassy with the R675 northeast of Annestown. This road crests the exact top of Kilfarassy Hill. 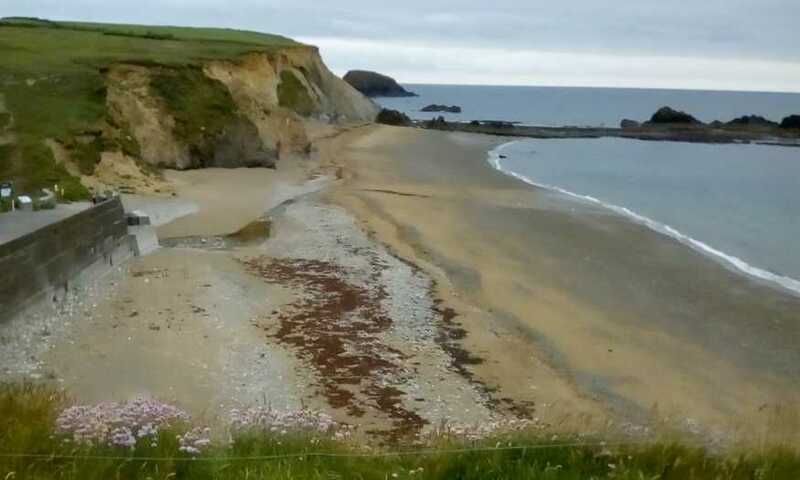 A much better way of doing it is to park at Kilfarassy beach, walk to the western side of the carpark and take the obvious path uphill along by the cliffs. Boulder clay constitutes much of the cliffs around here. There’s plenty of erosion so mind how you go. When you get in line with the promontory fort as marked on the, ahem, promontory on OS sheet 82, turn due north. The aforementioned road, and the top of Kilfarassy Hill, lie a couple of hundred yards away across fields easily negotiated – only one small fence to cross. Then climb the gate to the road. In our case a kind and considerate farmer opened the gate as we arrived – how’s that for service? You can then walk down around the twisting narrow laneway of a road to the car waiting for you at the beach carpark.